It was time to catch up with a bunch of lovely ladies I hadn't hung out with for a while, so we headed to Debacle Bar in Braddon. 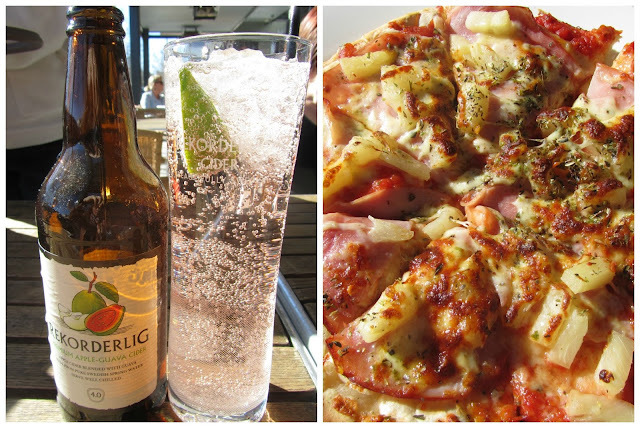 I had a hankering for a cider and pizza and I wasn't disappointed. It's been a while since I've cruised Lonsdale Street so I was pleasantly surprises to discover it's all looking very contemporary and has a whole bunch of trendy eateries. Debacle is more of a pub than a restaurant (right up my alley). It's located among galleries and boutiques which adds to the charm. We arrived at 2.30 just after the lunch time session, so it was very quiet. By the time we left at 4.30pm it was bustling with friendship groups, families, birthday drinks and people just knocking off work. 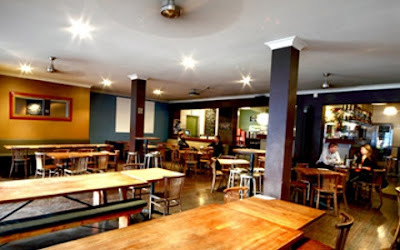 Rumour has it they have over 150 Aussie and imported beers, ales and wines to choose from. They've got a good pizza menu as well as other food such as tapas, burgers, nachos, pasta, salads and a kids menu. The menu is available at both lunch and dinner. They're also open for breakfast. It's got a very casual decor with a combination of wood and metals. It's comfortable and open. You can sit indoors or outdoors and can grab a table for four, a bar table or big long bench tables for big groups. There's plenty of space. Debacle is situated at 24 Lonsdale Street in Braddon. They're open Monday-Friday 8am to midnight and Saturday and Sunday 8.30-midnight.